Do I need to complete a separate application for each scholarship? One application is sufficient. However, since some scholarships are for different majors or different criteria, your essay should mention the criteria that applies to you. For example, if it says a student participating in a musical activity, you should mention what musical activity you plan to join (chorus, band, etc). Please note that all Foundation scholarships require a short essay. The scholarships that have a particular deadline should have that information included with the description. Other scholarships will have “Awarded for” if they have been awarded for the current year. You may apply for any future school year. What does the criteria “need” mean? “Need” means that the student and his family have somewhat limited financial resources and the student cannot afford to attend college without some financial aid or scholarship. For example, qualifying for a Pell Grant is evidence of need. However, if you do not qualify for a Pell Grant, you could still explain in your letter why you have limited financial resources. The number of scholarships awarded does affect need. A student who is receiving the lottery scholarship, a Presidential scholarship from SAU, and the El Dorado Promise scholarship does not have much need of an additional scholarship. “Meet University guidelines” means that the student is taking the necessary number of hours to qualify as a full-time student and has a high enough grade point average to enroll the following semester (not on academic probation). Currently, first semester freshmen must enroll in a minimum of 15 hours and must complete a minimum of 12 hours by the end of the fall semester. Thereafter, each recipient must complete 15 hours per semester. Yes. Click here to submit an online application. When will I be notified that I was awarded a Foundation scholarship? Foundation scholarship recipients will begin being notified May 1st. It will take 2-4 weeks for all scholarships to be awarded and the recipient notified. 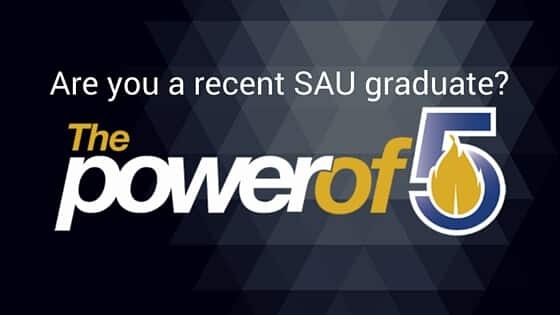 For any other questions, please contact the SAU Foundation at 870-235-4078.